We pulled into the Winfield COE Campground on the J. Strom Thurmond Reservoir late this morning and it is definitely a winner. 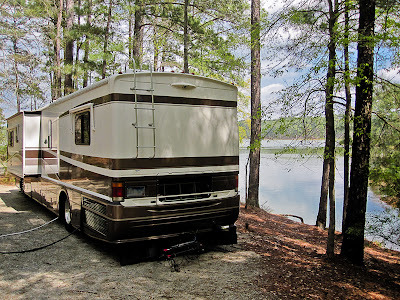 We have had a week of gloomy weather, less than desirable campgrounds, and of course our saga with the Norcold refrigerator. 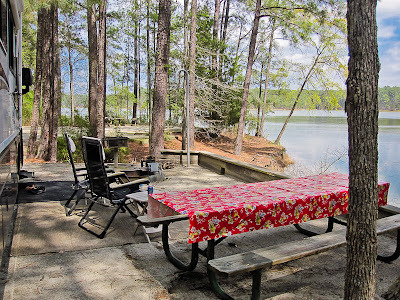 We made a reservation at this campground several weeks ago and even though it wasn't our first choice of campgrounds here, it turns out to be exactly what we needed. 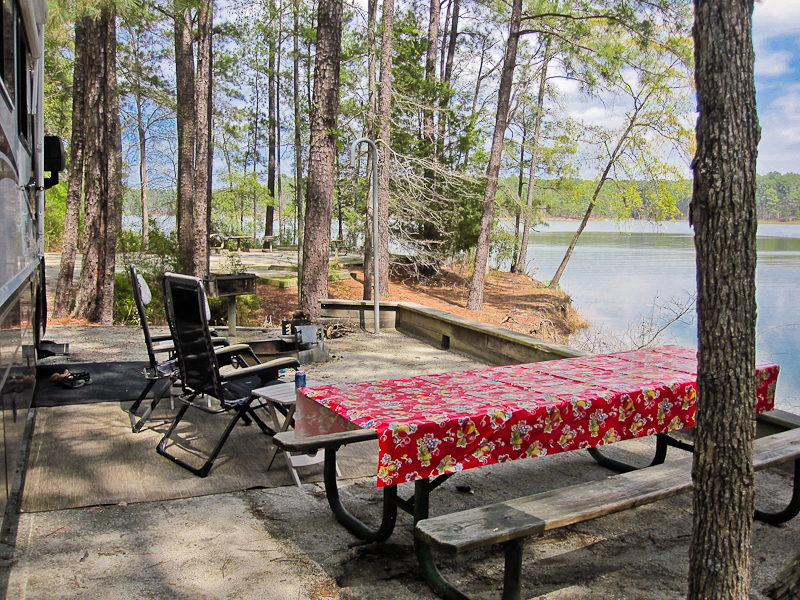 We have a large private pull through site overlooking the water with 50 amp electric and water. What more could you ask for. Wednesday morning we had a very rainy drive up to the Augusta area and pulled into Travel Country RV. They were supposed to have repair parts waiting for us, but Norcold wouldn't ship them until this dealer could run a few tests. 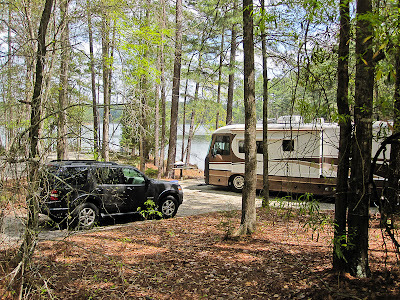 So 15 minutes later, they ordered the parts and we found an RV park in the Augusta area to spend a couple of days. The only way Norcold would expedite the parts was if I paid for the shipping, which I did. We used Thursday to take Mollie to the groomer and to stock up on a few groceries and do a little clothes shopping. I did not do as well as I was hoping on my weight loss for March. I only lost 3 pounds, but I have dropped another pants size. I have gone from a tight 44 to a 38. It has been a long time since I bought a pair of pants that size. I have a photographic workshop coming up in a couple of weeks so we stopped in at Kohl's to buy a couple pair of jeans and a couple of shirts. I have gone from XXL to XL so that is also good news. Sometimes the progress seems painfully slow, and I tend to treat this like a problem to be quickly solved. What I am learning is that even when I do reach my goal the process won't be over. I'll be writing more about that in the coming months. For now I know that if I "JUST DO IT" the weight will come off. The RV dealer called yesterday to tell us the parts had arrived. So this morning we headed back over there and got the new parts installed and.........our Norcold is now MoreCold!!! 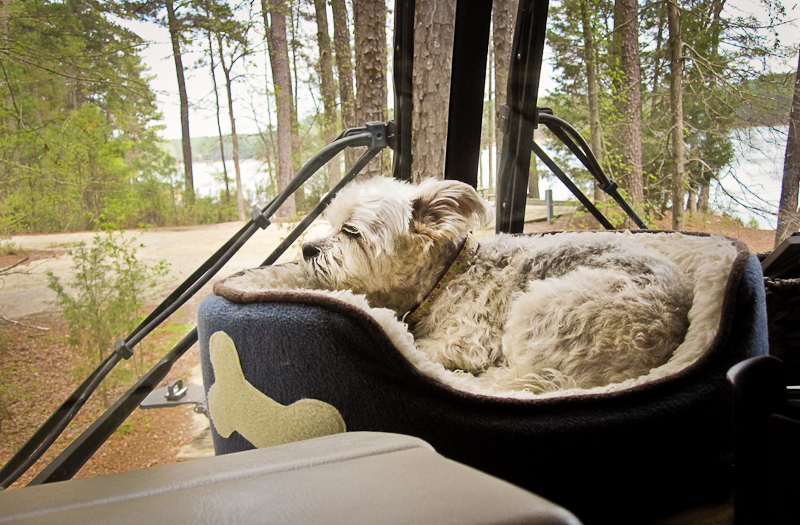 We appreciated the personal service that Travel Country RV gave us, especially Clint the service manager. It was a short 20 minute drive to our destination and it didn't take long to get our little camp set up. If you have ever experienced a truly peaceful place and the feeling of a weight being lifted from your shoulders you know how we feel right now. To be at peace with your surroundings is truly balm for the soul.